Siegfried Anzinger’s work has received the Alpine Republic’s highest accolade in the form of »The State Prize of Austria 2003«. It can be regarded as both recognition for this artist and the painting of the 1980s and 90s, which everybody seems to have struggled with, be it in official quarters or on the part of the artists themselves – on the one hand the institutions seemingly too powerful, and on the other the scandal of actionism too deep-seated. Perhaps that is why Siegfried Anzinger left his homeland 1982 and emigrated to the Rhineland, where, since 1997, he has been professor at the Academy in Düsseldorf. The focal point of his life is here, and it is here – far away from that Vienese world – that his work can flourish; it is formally mature, controlled and incredibly rigourous, and yet at the same time has room for many surprises. Mythological figures meet contemporary perception in fragments and the formation of legends is measured by the yardsticks of life study and phallus. For in the world of myth and mythology, it would seem too that truth does not lie in falsehood and absolute will still conquers every imaginable form. This is the contradiction which Siegfried Anzinger winkles out in his magnificent series of water colours: the scene is quickly defiled by the sexual, quickly undermined, where feeling can discern no exit. 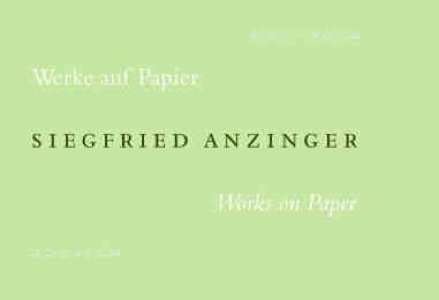 Be that as it may, Siegfried Anzinger is nevertheless the master of the balcing act, a fact which is abundantly clear from the works themselves, originated between 2001 and 2004, floating between the extremes of the profoundly serious and airy cheerfulness.